This week, the House Insurance Committee, of which I am a member, held an informational meeting to learn more about legislation to help ensure the viability of rural hospitals across the state. House Bill 2532 would establish the Rural Health Redesign Center, a public-private partnership, which would administer the PA Rural Health Program. This would help strengthen rural hospitals, keep jobs local and increase access to health care. 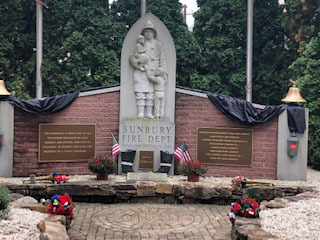 Last weekend, I had the chance to honor men and women with our local fire companies who passed away at the 29th annual Sunbury Fire Department Memorial Service. Every year, our local fire companies come together to acknowledge the service and dedication of the volunteers within their ranks who have passed away. Thank you to everyone who attended this year’s event and to all those within our local fire companies who not only coordinated this service but for their continued efforts to protect our communities. Currently, more than 800 Pennsylvanians are waiting for an organ transplant. More information about organ donation in Pennsylvania is available here. Legislation to expand eligibility for the state’s PACENET prescription drug coverage program passed the House last week and is moving to the governor’s desk. Up to 17,000 Pennsylvania seniors are expected to benefit from this expansion. To make it easier to report concerns on state roads, PennDOT has modernized its online customer care center. The new website will include new mapping capabilities, optional photo uploads and a mobile-friendly interface.